Wondering Which Trailer Brake Control You Should Use? The only brand of electric trailer brake control I've equipped my rigs with for a goodly number of years is Tekonsha. With the reliability & durability I need, I've never been left without brakes by a Tekonsha electric brake control. The fact that I've hauled a heck of a lot of miles without any whooooooooeeeee! What the heck happened to the brakes?! is the best testimony I can give! I'm sure one has failed someone here or there but I, for one, can say I've never had one dump on me! I've wondered for some little while, why the truck manufacturers call it a "towing package option" when they didn't even include wiring for an electric trailer brake control? Seems like sort of an important part don't it? Well, they finally (if you weren't already aware) have got their ducks lined up proper in that regard. Don't know when they started, since my last truck before Big Red was bought back in January of 2000 (and it was a '98). 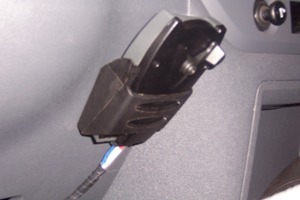 But sometime since then they've started including an electric trailer brake control, plug in, harness. A genuine, un-adulterated, double rectified, no brainer! About time too ! Yep, just pop, snap, and it's in. No smoke or sparks or nuthin' ! Just like some of my other wiring projects ! Not very exciting, but I'd rather collect my excitement out in the woods or on some lake rather than layin' on my back,wrapped up in the pedals and tangled in the wiring harnesses under the dash ! Doing the splicing might get a little cornfuzzeling. What with the blue wire with the green tracer to the red wire with the brown dashes, and the plain blue wire to the orange wire with the white dots, yadda yadda yadda. It's pretty easy to get a mite lost. I had to stop and recheck things a time or two! 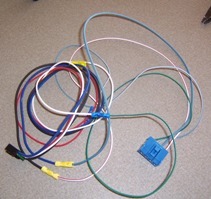 Once you sort out the current automotive electrician color fashions the directions are really pretty clear and simple.If you just take your time, triple check your connections, you'll be just fine. With the plug in harness and color coding directions there really is no need to pay anyone to do the installation for you. I've always been a touch nervous about electrical wiring. Especially in late model vehicles, considering all the electronics and computers. Get one wire crossed and PPPFFFFFFFFFFTTT ! Sparks, smoke and something gets cooked that is really better for you to not get baked ! Again, with the clear directions and plug in harness for the electric trailer brake control provided nowadays, no problem. Simple splices, mount the hardware, do the startup adjustments ...... zippa dee do, you're done and ready to go brake things ! Oh come on ........ that's sorta funny ain't it ? 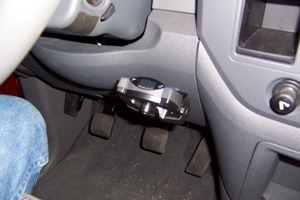 First is finding a good spot to mount the electric trailer brake control, itself, under your dash. There are already so manygizmos, gadgets and compartments that space is at a premium. Pay close attention to the manufacturers instructions regarding orientation. With the inertial, progressive type electric trailer brake control, the angle from the horizontal (not exceeding 70 degrees) and being parallel to the direction of travel are both critical. That and watch out for your knees. If you're a little runt like yours truly you've got to sit kinda close to the dash anyway!Imprinting your electric trailer brake control on your knees really isn't an entertaining activity ! I mounted mine just to the right and a bit lower than the steering column ...... for me just about the only spot where the angles were good and I can keep from snagging useful body parts on it. For some reason, the way Heidi sits, it's a lot closer for her, so check it out. Lucky for her I do most of the driving! Take a bit of time and a roll of vinyl electrical tape and tightly wrap all those loose wires of the spliced harnesses up into asingle, neat, tidy harness. It'll make a much better looking installation don't you think? 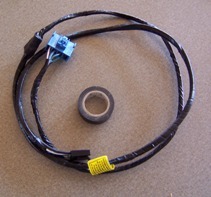 And, it'll keep the wiring tangle under your dash to a minimum. Not to mention being able to brag about what a shiny professional job you did ! 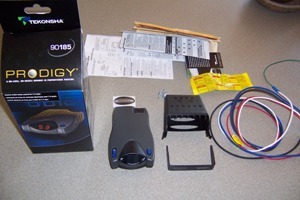 Of Tekonshas' options I chose to install the Prodigy electric trailer brake control in Big Red. I have discovered a wart on it's otherwise un-blemished hide though. Reading through it's literature ( I know, guys aren't supposed to do that ........... but every once in a while I just get curious) I spotted something I'd previously overlooked. Tekonsha pretty clearly states, for those of you who are paying atttention, a bit later for those of us who weren't, that it IS NOT COMPATIBLE with the electric - hydraulic brake systems. If you have one of those or are contemplating having one of those flashy new disc brake systems installed, the Prodigy brake control will not work. You'll need to make another choice. Since I was not paying attention and failed to ask the right questions when I bought my unit, I will most likely need to swap out my controller this winter. Fudge ! I've been planning on having Moryde do the disc brake conversion on our fifth wheel when we pass through Indiana this fall/winter, along with the suspension upgrade they build. Plan is to be ready for Alaska in the spring ! Outside of that, the Tekonsha Prodigy brake control is a keeper!